A D.C.-area credit union is sponsoring a military appreciation section at Nationals Park for the next few years, which means 8,000 free tickets available to service members, veterans and Defense Department civilians. 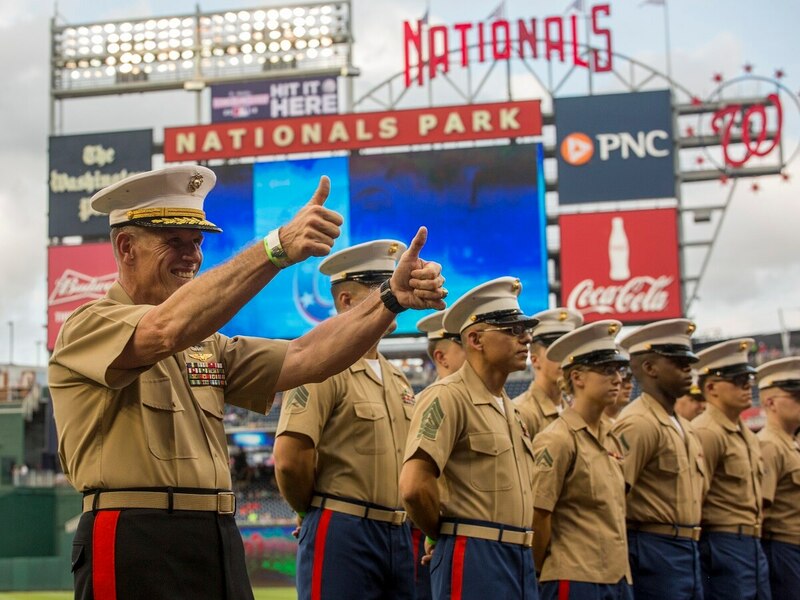 Pentagon Federal Credit Union’s Free Tickets for Troops program has sold out almost every night in the first of its three-year deal, president and CEO James Schenck told Military Times on Monday, as Schenck prepared to throw out the first pitch at the Washington Nationals game. “A lot of them are always deployed on the holidays and throughout the year, so it’s nice to be able to give them something for free to show that we care, and they can have a nice day with their families,” he said. If you’re assigned near D.C., spending a few days on temporary duty or just visiting for fun from April through September, there’s a free baseball game in it for you. “The entire Nationals organization has been amazing for our veterans and our active duty families, so we’re really excited about their support of what we’re doing,” Schenck said. At every home game, the West Point graduate said, PenFed offers up 100 seats in a shaded section overlooking right field. Active duty and Reserve service members, as well as veterans, retirees, DoD civilians and dependents can sign up for tickets using a GovX account as verification. But the partnership is not meant to be an ongoing advertisement for the credit union, one of several who specifically serve Defense Department employees. Tickets to games can be claimed online and picked up in person on game day with a valid military ID or proof of service. PenFed is taking their partnership three years at a time, he said, but will continue to explore ways to give back.